I will repeat this over and over again on my blog – drowning is silent. I wrote a post about it last year (see link) and I’m considering republishing it this year. I can not reach enough people with this message! Also remember that most drownings occur when multiple adults are present. Don’t assume someone else is watching your child(ren) in the water. Designate someone to watch children in the water and make a clear hand-off when you want to switch people watching. Don’t always rely on the life guards either. They have more than just your children to look out for. There are tons of food drives during the school year and especially around the holidays, but did you know that summertime is when food shelves need your donations the most? Children are guaranteed at least one meal a day during the school year because of school lunches. What happens when there is no school? The kids go hungry. In addition, some families might not need to use the food shelf during the school year because school is like a daycare. When summertime comes budgets become more tight because parents now need to pay for daycare too. That’s when the food shelf is helpful in paying for groceries. While most of us know not to leave our children in the car on hot days, it can be easy to accidentally leave an infant or toddler in the car. Shop With Me Mama tells just how easy it is to forget (see link). I’ve heard that taking off your left shoe and putting it next to the car seat works to help you remember. What ever you do, just find a way to remember! A lot of people think it’s ok to leave pets in the car if the windows are cracked. Did you know that air does NOT circulate through those cracked windows? Don’t think leaving the air conditioning on is any better. Dog can easily panic when you are gone and can accidentally push buttons. If you wouldn’t leave your child in the car, why would you leave your pet? Just like food shelf donations go down in the summer, so do blood donations. It’s easy to forget to donate when you are constantly on the go and having fun, but just as much blood is needed during the summer as is during the winter. Don’t let someone else’s summer vacation be ruined because you were too busy to donate blood. Whether it be sidewalk chalk, riding their bikes, or simply watching bugs crawl on the asphalt, kids play in the driveway during the summer. As a pediatric intensive care nurse, do you know how many accidents I see where kids are run over by a car in their own driveway? Too many to count! I hate to say it, but the majority of the drivers are the grandparents. It’s a rule in my house that the car does not move in the driveway until everyone (including the dogs) are on the grass where I can see them. Even my 8 year old must follow this rule. Remind yourself and others who visit to check behind the car before backing out of the driveway. Though fireworks are usually associated with the 4th of July, fireworks happen all summer long. Please be mindful of your dog when you know that fireworks will be booming near you. Dog’s ears are much more sensitive than ours, therefore dogs are often terrified of fireworks and can run away or hurt themselves out of fear. If your dog is outside, put him/her inside (or provide a safe shelter) as soon as you hear the first bang. Or better yet, before the first bang if you know when the fireworks will start. 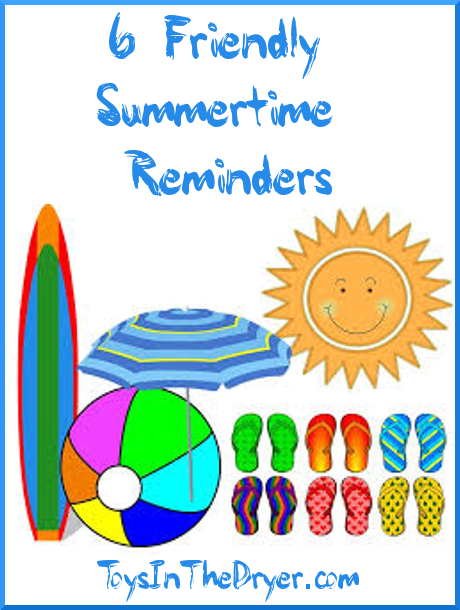 Keep these 6 friendly summertime reminders in mind and have a GREAT summer with your family!